It just occurred to me again that this July 28th is the one-hundredth anniversary of the start of World War 1. The “Great War” or “War to End All Wars” was a dark period in history, so much suffering, so much destruction. How much have we learned as a society? 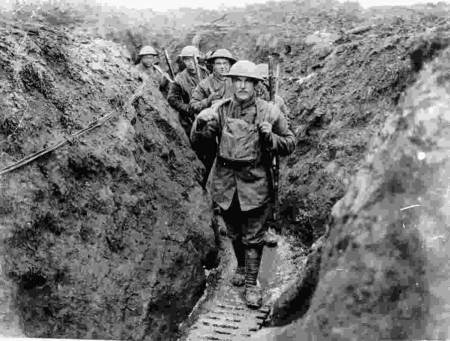 For many people in Europe World War 1 was a war that left them with nothing. Their way of life was annihilated. For others life itself was gone and their families and communities could never be the same. What am I afraid of loosing? What possessions, family, friends, habits, physical abilities, pleasures am I counting as necessary for life? So much of what society took for granted as basic was unraveled in the guns and poison gas of the “Great War”. What am I building my life upon? “For I am convinced that neither death, nor life, nor angels, nor rulers, nor things present, nor things to come, nor powers, nor height, nor depth, nor anything else in all creation, will be able to separate us from the love of God in Christ Jesus our Lord.” Romans 8:38-39 My life as a Christian should be built on the solid rock of Jesus Christ. Civilization did not actually end after the smoke cleared on the western front in France. Nothing can really stop God’s love for humanity. Jesus said it on the cross, “It is finished”. Death is defeated. No longer can the devil do his worst to us,because of Easter. Victory belongs to Christ in the end. Nothing can separate us from God’s love in Christ Jesus. There really isn’t anything that can destroy my peace if it is really built on Jesus Christ. So much of what I fear, is not really going to destroy me. I can face the future with more hope knowing what the past has taught us. No matter how cataclysmic the circumstance nothing can prevent us from living fully in the love of Christ! This is the verse that popped into my head when I saw today’s FMF prompt. What an amazing verse it is! Great perspective…very fitting historical reference and scripture. Thanks for sharing!